Palm Springs, CA – Feb. 5, 2011 – In game one of Saturday’s doubleheader, the Palm Desert Coyotes made easy work of the Coachella Valley Snowbirds winning by a score of 12-3. The Coyotes got off to a quick start scoring two runs in the top of the first off a Chris Fratini RBI single and a Russell Dixon sacrifice fly. The Coyotes tacked on two more in the second on Wes White and Jordan Drake singles to go up 4-0. After each team put up one run in the 5th inning, the Coyotes put the game away in the 6th. Kevin Hoeff led off the inning with a Homerun and the Coyotes offense added four more in the 6th to take a commanding 10-1 lead. Kevin Crimmell was the starting pitcher for the Coyotes and went five innings giving up only one run. Game two featured the Palm Springs Chill and the Canada A’s, and the A’s were unable to send the home crowd home happy on Canada Day here at the ballpark. The Chill came out on top defeating the A’s 11-6. The loss ends the Canada A’s six game winning streak. Both teams put up three runs in their half of the first. 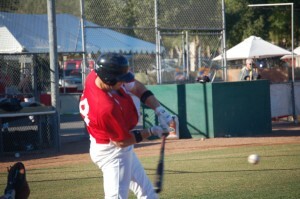 The big hits were Andrew Kuhn’s RBI single for the Chill and Brett Flowers RBI double for the A’s. Jonathan Cluff broke up the tie in the third with a 2 RBI triple to give the Chill a 5-3 lead. The A’s immediately responded with two runs of their own in the third to tie the ballgame up once again. Nick Spears put the Chill up for good with an RBI single in the fifth scoring Andrew Kuhn from third. The Chill added three unearned runs in the 7th to give them a 9-5 lead. Daniel Stenavich came on to work the 8th and 9th innings for the Chill and closed out the game after giving up 1 run in those two innings of work. The California Winter League resumes on Tuesday when the Palm Spring Chill will face the Coyotes at 1pm and the Coachella Valley Snowbirds take on the Canada A’s in the 5pm affair. All draft beer will be $1.